I guess I should begin this review stating who these three people are. Mike Bloomfield worked with Bob Dylan during his electric revolution. Just previously to this record, he formed the psychedelic blues band Electric Flag that I should listen to one day soon. Al Kooper is a multi-instrumentalist who formed the highly regarded jazz-rock band Blood, Sweat & Tears, an even more famous band that I should listen to one day soon! And then there's Stephen Stills who was a founding member of Buffalo Springfield and obviously would later be a namesake of CSN and the only reason why this album is associated with CSN. 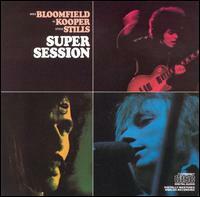 It's interesting that this album was originally meant to be just a Bloomfield and Kooper album. Bloomfield was a drug addict, and he couldn't perform for the second half of the album. Thus, Kooper asked Stills to contribute in his place. Well, Bloomfield and Stills are different people --- so the two sides are pretty different. Simply, the first side is very bluesy and the second side consists of rambly psychedelic music. It's also notable that this album is also known as the first time Stills was able to act as a more independent force. He didn't write any of those songs... I guess there wasn't time for that. According to the All Music Guide, Super Session was an important landmark for the progression of rock 'n' roll as an art form. I guess it's amazing what weird things paid critics will say. But they say the same thing about Neil Young, so there's that. Their reason for calling this influential seems to be because it contains overextended songs. But they failed to notice that Procol Harum had a 20-minute prog suite called "In Held Twas I" released the same year. That song was actually planned. Any skilled musician can goof around in a recording studio to create a meaningless 11-minute, rambly version of Donovan's "Season of the Witch." I don't want to sound negative, because I think this music is pretty enjoyable. It's certainly worth owning even though I can safely say I'll never listen to it again. I'm too busy relistening to David Bowie and Kate Bush albums to bother with this rambly inconsequential music! As on-the-fly entertainment goes, this is wonderful. I have enjoyed myself while preparing to write this review, and this is a fun album above all. At the very least, neither Kooper, Stills nor Bloomfield were drummers, so there was no obligation to include any idiotic drum solos. You know, drum solos are my primary fear toward jam-rock. 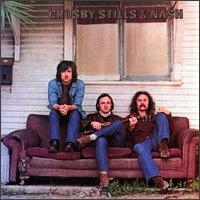 Crosby, Stills, and Nash are a supergroup comprised of individuals that I don't even have to name. They're ... um ... Crosby, Stills & Nash. Why they couldn't come up with a fun name for themselves like the Boondock Freebees or something is the stuff of legend... Or maybe not and they just wanted to treat themselves like three independent forces coming together. Neil Young would famously end up joining them in the festivities for Deja Vu, anyway. I almost don't need to tell you where these guys come from, because it's common knowledge in these circles on the Internet. But, I guess anyone visiting my site for the Kylie Minogue reviews and randomly clicking on this link might like to know. 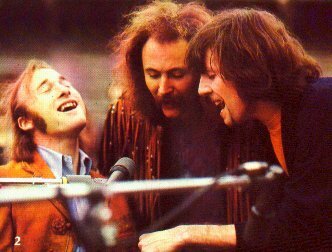 David Crosby is arguably the most "important" member of the group --- Well, he's from The Byrds, which is unquestionably one of the '60s most landmark groups. I mean, they're in the Top 10 most important bands ever. That's how serious that is. Pluto Nash is from The Hollies, which I absolutely love. They're not one of the greatest classic bands of the 60s, but they were responsible for some hopelessly wonderful tunes. And then Stephen Stills is from Buffalo Springfield. Together, these Super Heroes band together and --- Well, they form a rather excellent album. You could describe this album as a combination between the members' different powers. There's a bit of uniqueness, poppiness and charm to most of these tracks. It's certainly worth describing this music they're playing! I would have assumed that they would have made country-rock, but this is just your average soft-rock. It sounds like a tone-downed version of 1966 Byrds or something! I almost hate to not be an enthusiastic fan of this body of work. This is one of the few albums that I review on this site that I've actually owned a physical copy of this album for about five years. I worked as a delivery driver at the time, and I remember going to and from delivery locations listening to this album in the car and trying to force myself to be a fan. Yeah, if you have to force yourself to be a fan, you're probably not going to be one! I also remember the first moment I put on The Soft Bulletin, and I was an instant fan!! It's place in history often gets bastardized by their fans. I've had a few interesting run-ins with an individual over something I wrote about Deja Vu --- he unwaveringly supports that album as being one of the most influential bodies of work of all time. Crosby, Stills & Nash falls under that category, too --- but not as much because Deja Vu has Neil Young in it, and as we all know, Neil Young is Jesus. But anyway... You can call this CSN(Y) formation a landmark if you want to --- but they're just writing nice music based on the well established trends of the times. How do I know that? I listened to The Byrds, man... Honestly, I don't think these guys were interested in pushing any boundaries, anyway. That's the impression I get. If they were trying to push boundaries then, well, they failed miserably!! I'm hardly the only person with the opinion that this album isn't exactly a masterpiece, but I do like it. So I have a pretty neutral stance. I can say I *appreciate* this album, which is world's apart from worshiping it. It is safe to say that this album doesn't represent the best of any of these songwriters. Plus, these works are more often boring than not. It doesn't start out too promisingly with "Carry On" which features an OK riff, but a frankly uninspired melody. While I like their harmonic Byrdsian vocals, I suspect they are just doing them out of habit without much regard to the actual song they're singing. At the very least, Neil Young makes two good contributions here, which tends to give life to this otherwise boring album. "Country Girl" is almost a masterpiece, and it's easily this effort's greatest track. The melody isn't special, but the mood is thunderous and piques my interest. Also, his "Helpless" is a pretty ballad that's only downfall is the lack of a truly endurable melody. The best melody of the album is probably "Woodstock" although that's a Joni Mitchell cover. (This is a good example of these guys' rather unfortunate limitations --- at least in the year 1970.) "Our House" tends to stick out melodically --- it sounds like they were trying to emulate the Beatles! But their efforts didn't prove to be so great, because that melody even grows old after awhile, which is something the Beatles would never do. 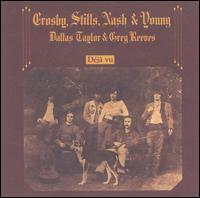 Not all of this is a disappointment after hearing this group's original album, Crosby, Stills & Nash. But, well, it is sort of a disappointment. For example CSN has "Marrakesh Express" in it, and that song was fun. Why they had to axe songs like that for a boatload of ultra-serious and pretentious tracks is an attitude that I have a difficult time accepting. However, this album does have loads of fans who, incidentally, are also probably ultra-serious and pretentious!! (Actually that's true --- I've had some run-ins!) Both of these albums have a similar quality of songwriting --- There's not a poor or derivative track in either of those albums, and that's worth a lot more than I'm letting on!! At the very least, these guys are quite good with their instruments. That's not a great reason by itself to get an album, but at least this effort doesn't sound amateurish. Deja Vu is an accomplished album, and you have to respect it for that. But at the same time, I don't believe it to be incredibly inspired. This is the work of a "supergroup" who have nothing to prove. It's a fairly complacent record, and it could have used a good jolt or two of electricity. Our favorite hippie from Buffalo Springfield and Crosby, Stills & Nash records his first solo album, and it's ... um ... Quite good! 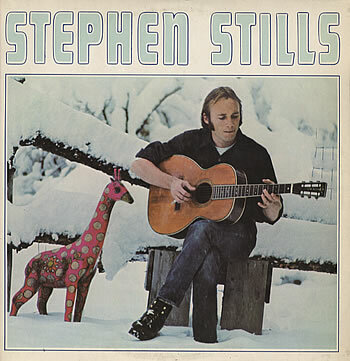 Unfortunately, Stephen Stills is just an average songwriter, and he's neither better nor worse than he had always been. Well, consider that good news! It's safe to say that Stills seemed excited to be writing his first album. He does everything that a great album should do. He opens the album with the upbeat and joyous "Love the One You're With" that gets us right in the mood to listen to a great album. He ends it with the soulful, thunderous and conclusive "We Are Not Helpless" that gives us the vibe that we can now go forth into the world with our lives now changed, because we just listened to this great album. In the middle, we have everything from rock to blues to folk, and some memorable experiences including Eric Clapton and Jimi Hendrix guest spots. All the ingredients might be right, but the only thing preventing Stephen Stills from being a great album is, well, it just doesn't have great songs! Don't get me wrong --- they're alright. I certainly like a fair deal of them. The song that Clapton is on is very entertaining. But no matter how much you want to deny it, Stills just isn't a great songwriter. Most of his melodies are bland! His efforts to give them orchestration certainly don't go unnoticed --- songs like "Church (Part of Someone)" and "To a Flame," for example, have nice homely arrangements. But what's a well-orchestrated song without an endurable melody? So that's the story of Stephen Stills. He's boringly predictable, but he has his moments.